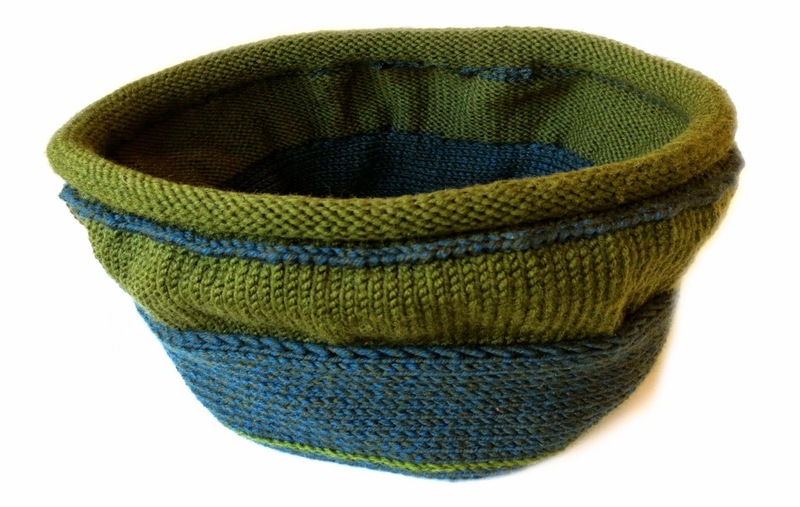 The Lazy Knitter Scrap Tam is one of my go-to scrap recipes. It works for all size humans: children, women or men, and features an "unvention" shown in the previous post: the deco bind-off Fake Latvian Braid (FLB). Going beyond the deco-bind off FLB, however, this tam is full of tricks. For one example, shown below are three (!) different tricks you can use to divide a random number of stitches for evenly-spaced decreases, regardless of whether the stitch count was evenly divisible in the first place --"order out of chaos" is my private name for this range of tricks. This tam's first name is "Lazy" for a good reason--no particular measuring or gauge is required, and very little stitch counting, yet the recipe will make a custom tam to fit anyone, and it's all done using scrap yarn. Specifically, this recipe allows for a one-size custom fit, meaning the tam is made for the head of the wearer, regardless of yarn or gauge. The only requirement for fitting is that the wearer's head be available for try-on at the end of the first step. As a scrap project, I use whatever is laying around. However--truth in advertising-- although I've made a bunch of these (10? 12? ), I've always used yarn in the DK/worsted/aran range. 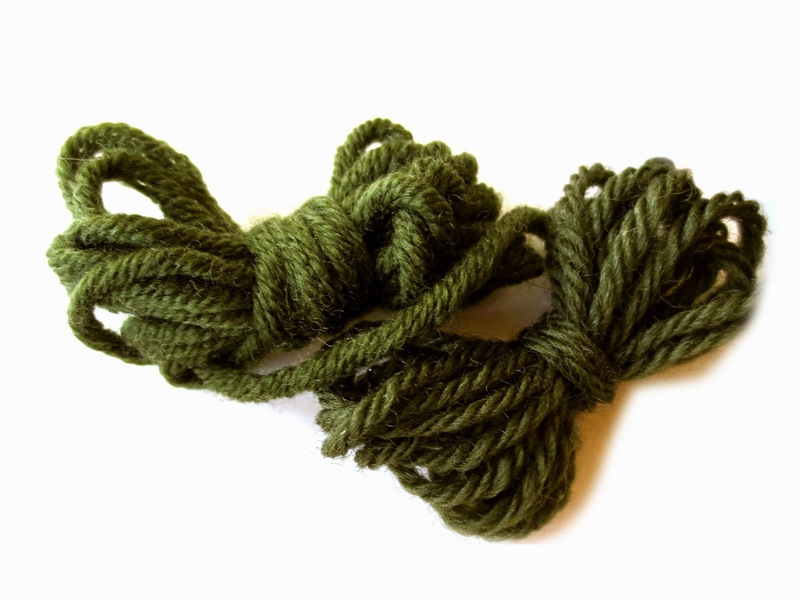 As you'll see with the blue/green tam featured in this post, yarns of different weights can also be mixed. Choose the yarn of which you have the most as your theme color--the band and all the FLB rows are knit from this color. A single theme color unifies a scrap project--the human eye delights in repetition--so it'll look carefully planned out. One contraint: as discussed more below, if you're mixing yarn weights, the heavier yarn has to be used for the lower part of the tam. The beige/multi tam is made of Dale Garn Heilo DK, a long-fiber, somewhat scratchy but very hard-wearing yarn--the tam in the illustrations is over 10 years old and gets significant wear every Wisconsin winter. I used around 50 grams of beige for the theme color and scrap-ish amounts of the other four colors: blue, gold, green and rust. 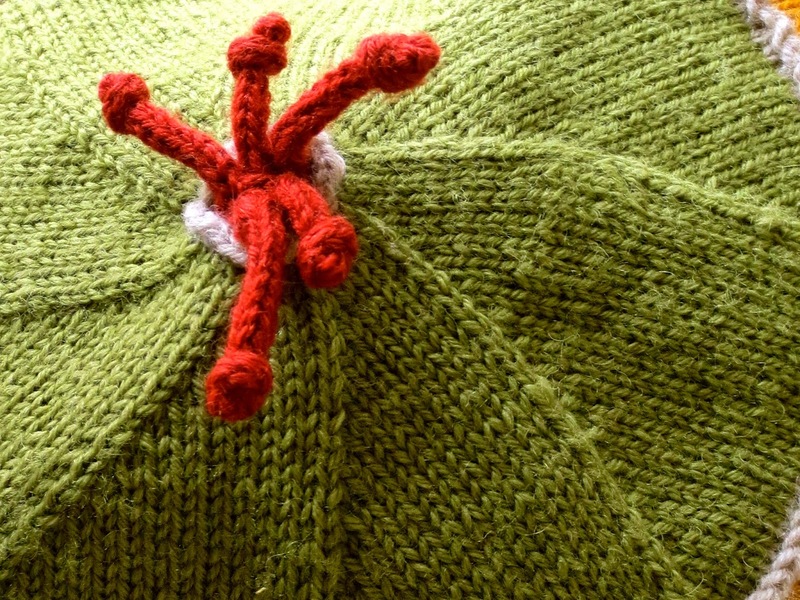 The tam was knit over the course of a year or more. 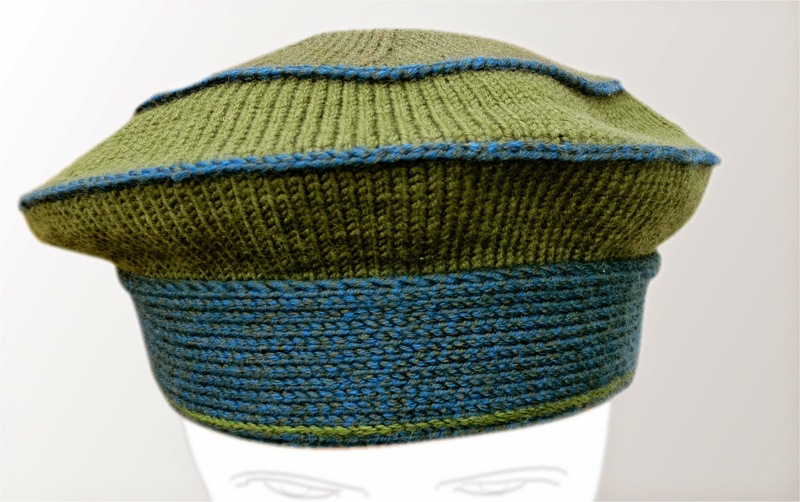 The blue/green tam is knit of Lana Grossa Bingo for the band and bottom two stripes. I had only a limited amount of Bingo--one ball of blue, which I used for the theme color, and one and a half balls of green (the limited amounts of yarn is why this was a scrap project). 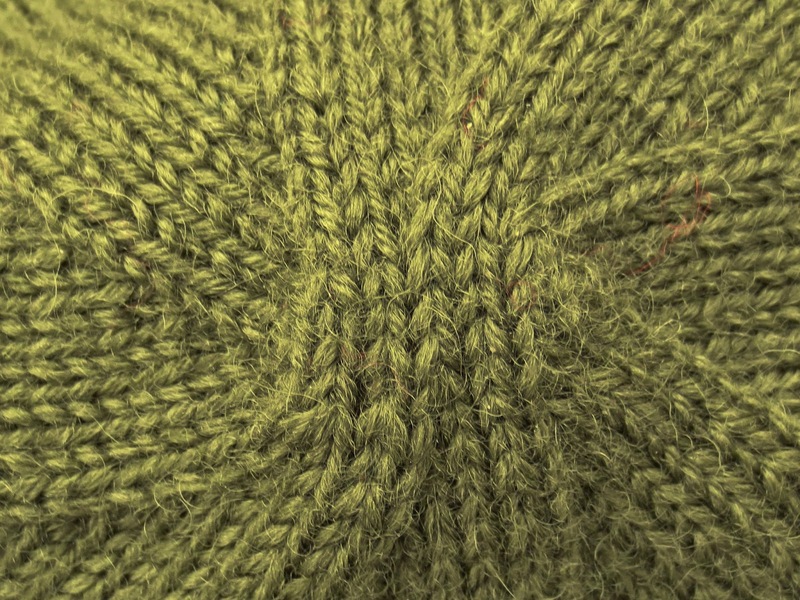 The top of this tam is knit of Heilo in a matching color. Bingo is a soft, thick superwash wool--very splitty, biases easily. From this view, you can see that the tam-top in Heilo is a slightly different color than the stripes below in Bingo. The difference in stitch gauge is evident too (same stitch gauge, but different row gauge, due to the Bingo being "pushed" (compressed) to a smaller stitch gauge than recommended by the manufacturer. Stiff-ish long-fiber wool yarns like Heilo make quite a structured hat, especially when knit tightly. By contrast, yarns with low body and a soft hand-- alpaca or "silky-type" acrylics, for example--create a rather slouchy snood-type result, especially when knit rather loosely. To make a stiff-ish tam out of the Bingo, I worked it tightly--6 stitches to the inch instead of the recommended 4/in. In other words, I treated the Bingo like a DK yarn, working it at the same gauge as the Heilo, then knit the Heilo at its normal gauge to match, as best as possible. 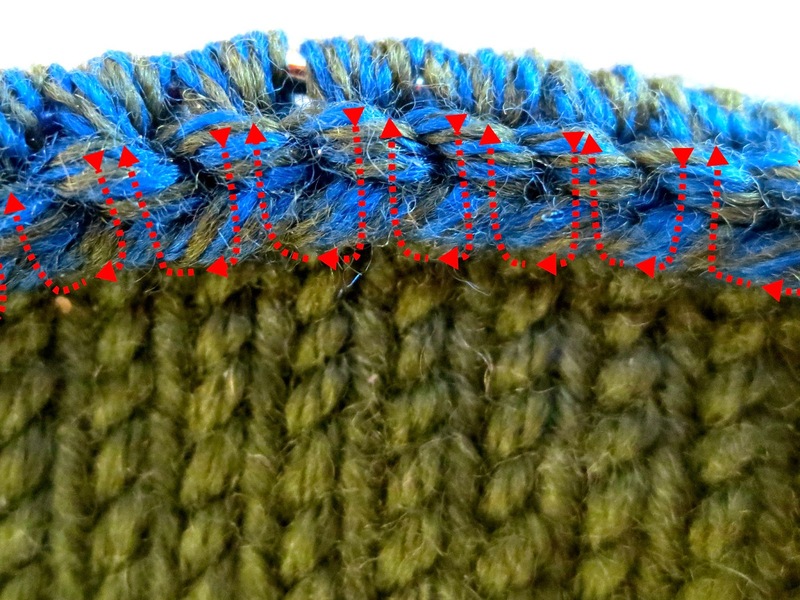 When you "push" a yarn to a different gauge, the stitch count will match that of a yarn normally knit at that gauge, but the row count will almost certainly exceed that of a yarn normally knit at that gauge, as shown in the photo above. 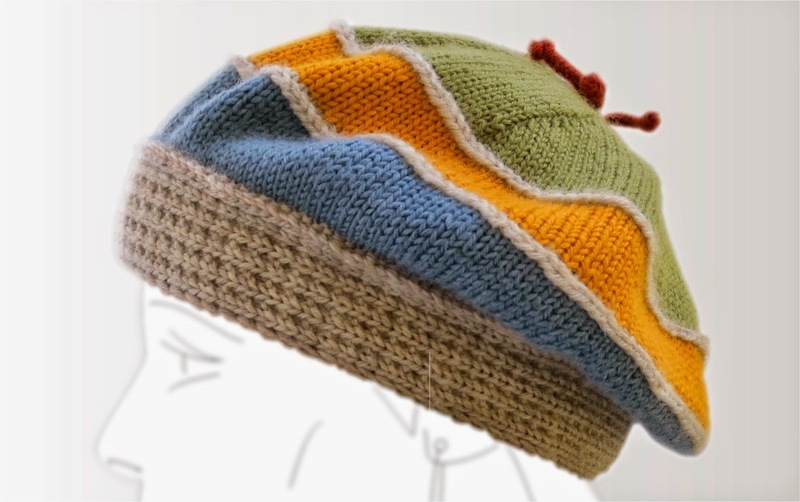 As is explained further below, the lazy knitter's tam recipe depends on the gauge of the band and the bottom stripe being proportional. So, if you choose to combine yarn weights, the heavier one must be used for the hat band and lowest stripe. This means you have to have scrap yarn at least two different color yarns in the same weight. Either the heavier or lighter yarn can be used for the second stripe, the top for sure can be made in the lighter yarn. 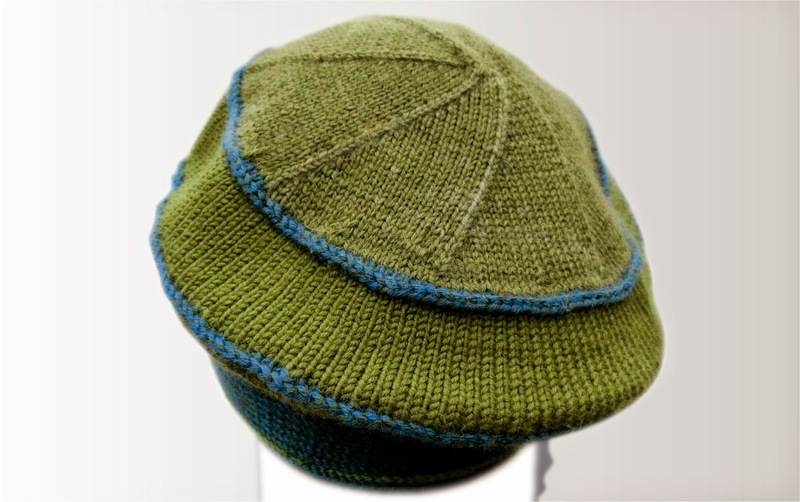 It is for this reason that the blue/green tam has the band + the bottom two stripes knit in the heavier Bingo, while the lighter Heilo reserved for the hat-top. Straight needles can be used to knit the band, but you'll need some form of circular needles (short circ, long circ-magic-loop style, dpn) to work the rest. This is custom one-size, fitted as-you-go. The size stems from the base diameter of the bottom band, which you fit by simply holding it around your head until it meets your personal ideal of tightness. It is possible that the hat will change measurements after it has been blocked, and this is especially so if it is knit loosely, or is of a silky hand, such as alpaca. All I can say is this is meant to be a scrap project, so your experience with the main project will guide your result here--if your sweater made with this yarn stretched all to heck, then make the tam tighter, expecting it will grow, just as the sweater did. Alternatively, consider knitting quite tightly indeed--stiff fabrics change less in gauge upon blocking than do loosely-knit ones. Band is knit flat (back and forth), the rest of the tam is worked circularly on stitches picked up through the long edges of the bottom band. 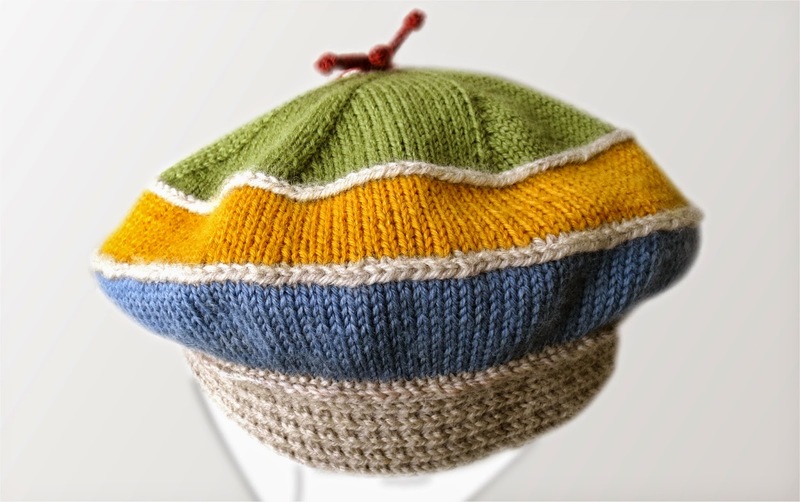 This tam is called the "lazy knitter's tam," and below, the recipe is offered in narrative form. In the narrative are links to all the different little tricks which allow for a polished finished product without a lot of forethought at the front end. 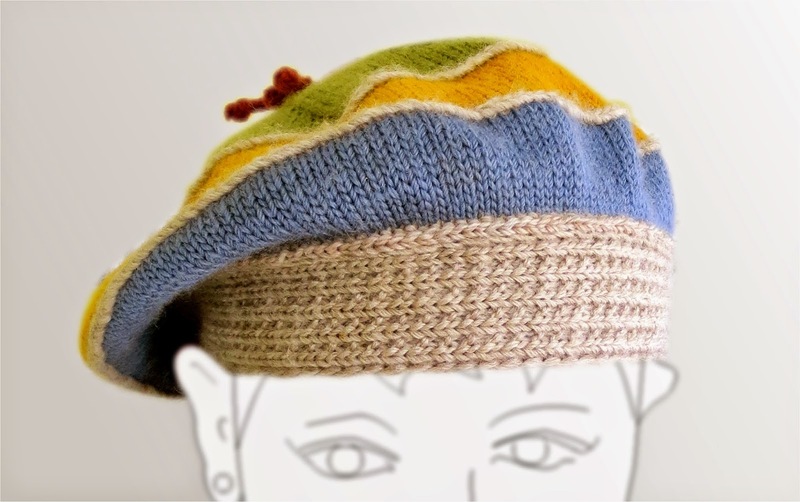 With the theme color (beige=lady's multicolor tam, blue tweed=man's blue/green tam) cast on enough stitches to knit a double-wide bottom band. Both of the sample tams have a band 25 stitches wide, which makes the band a lot higher when knit in Bingo (the blue/green tam) than in the Heilo (beige/multi tam). How I settled on this number is lost in the mists of time. This number works for me, but vary it any way you like--a quite narrow band will make more of a beret, a taller band will give more of a Scotch Bonnet effect. When folded in half lengthwise (along the dotted line) this fabric becomes the bottom band of the hat. The beige/multi tam has a broken rib pattern on the outside of the band. Here's the reasoning: When I knit circular, the knitting is nice and even, but when I knit flat, the knitting tends to row out. Rowing out is hard to disguise with steam blocking, but steam blocking is much faster than wet blocking, so I would always rather steam block if I can get away with it (remember, "lazy" is this tam's first name). Therefore, for the bottom band outside--the part that shows--I chose a near stockinette fabric which disguises rowing out --the broken rib pattern. 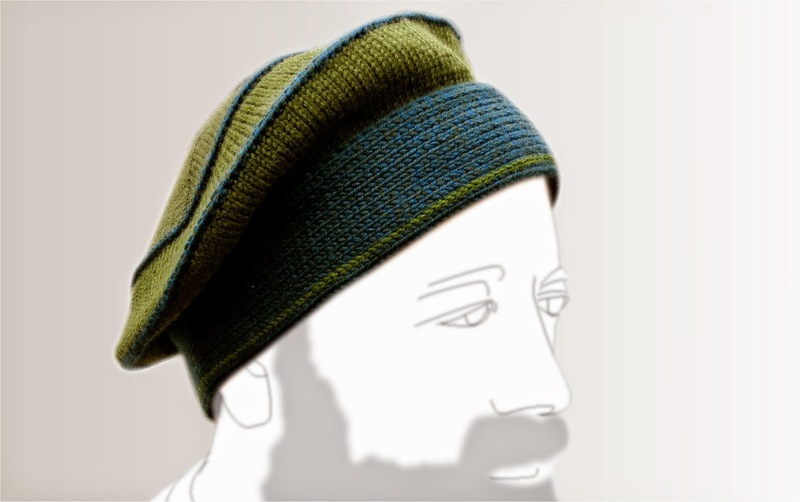 The band on the blue/green tam is pure, straight stockinette. This is because even so mild a pattern as broken rib was "too fancy" for Mr. TECH (he is a sad disappointment in the fashion department). This, of course, required extra attention to avoid rowing out. (In knitting--and cooking, too--it's ironic: a really good "plain" sometimes takes more care than "fancy"). On the beige/multi tam, the fold line is defined by a line of slipped stitches. In other words, the fold line was constructed by slipping the middle (13th) stitch of the headband, every front-side row. On the blue/green tam, as stated above, the fold line was not knitted-in, but was afterwards defined by the FLB of green sock yarn. There are other methods, too, for making a fold line, such as an Elizabeth Zimmermann afterwards- inserted phoney seam or any other method you can think of--or for a narrow beret-like band, no fold line at all--the narrow band forms a roll. The long outside edges of the bottom band were knit with a slipped-stitch selvedge. This makes picking up the stitches in the next step easier. 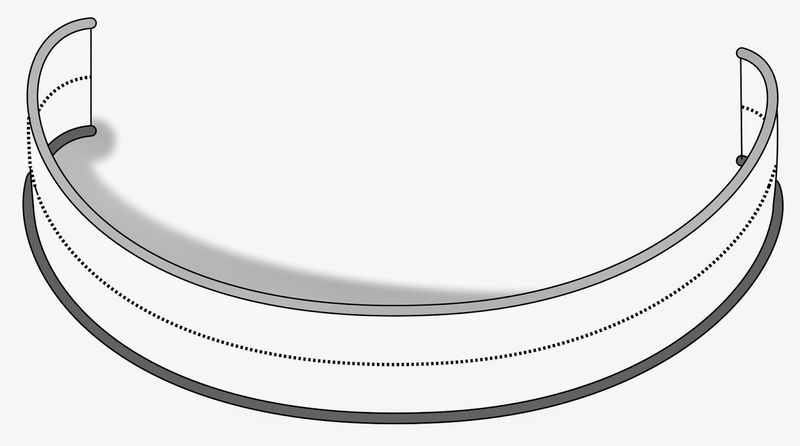 Once the band is a long enough rectangle, the ends are kitchener-stitched, resulting in a circle of fabric which looks like a double-wide ear band, as shown by the zig-zag below. 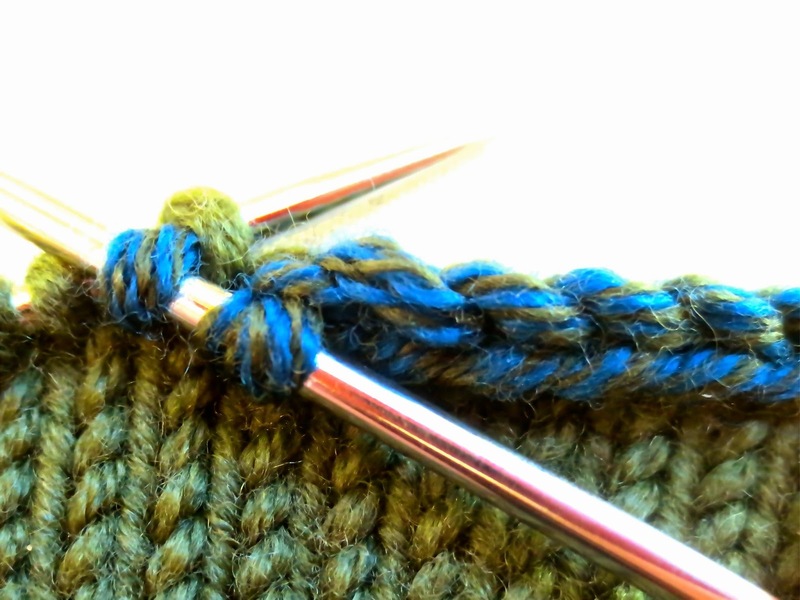 If Kitchener-stitching is not your thing, work a three-needle bind off--the seam will be hidden inside the band. The last step in preparing the band is to fold it in half the narrow way to form a double-thick, half-width band, with the texture pattern, if any, to the outside. Now comes a rather unusual procedure. To prep the bottom band for the first stripe, hold the folded bottom band lengthwise, then use the theme (band) yarn to pick up the stitches through band-top. In the above illustration, this edge has been folded to the outside--it is the dark selvedge. Because this long edge was knit with a slipped selvedge, picking up stitches is easy--each edge stitch is two rows high, making for a nice, large loop to pick up through. I find it easy to pick up through the front arm of the stitch with a crochet hook, then transfer to a short circ (14"), but this is utterly knitter's choice: any method of circular knitting will work--dpn's, magic-loop, two-circs, whatever, so as you pick up the stitches through the front arm of the slipped selvedge, transfer them to your needle of choice. Next, you repeat this process with the bottom (inside) selvedge--the lighter gray ring on the above illustration. However, this time, you pick up through the back arm of the slipped selvedge. The ultimate result is two (circular, dpn, whatever...) needles, arranged in concentric circles, each with the same number of newly-picked up stitches. The previous post in this series offered a pro-tip about offsetting the round beginnings and endings--offsetting reduces bulk and eases working in the ends. Rather than repeat all that, here's a linky which takes you directly to that tip. As offsetting applies to this recipe, at this point where you change colors to knit a stripe is the spot to work the offset by slipping a few stitches in either direction before you start working with the new color yarn. In the next step, you change color and knit together the front and back of the band. This is a variant of three-needle bind off. Specifically, using the new-color yarn, knit one stitch from the front needle, then one from the back needle, continuing in this alternate manner until the band has been knit shut. The below photo shows the method in progress on the blue/green tam's band--each of the two circs at the band top has the live blue stitches picked-up through its respective band-edge, while the third needle, the active needle, carries the green stitches being used to knit the band shut. Not only does this trick knit the band shut, but it also corrects the stitch count to what is required for a tam. Even though we picked up only 1 stitch for each two rows, the fact that we did it twice (once on each long edge of the band) yields what amounts to a 1:1 pick up: one live stitch to be knitted up for each row of the band. Specifically, like most (all?) non-garter stitch fabrics, the band’s gauge has more rows per inch than stitches per inch. Therefore, a 1:1 pickup rate makes for a fabric wider in the stripe than the headband. At the end of this pick-up round, all your picked up stitches have been knitted together in the new color. In other words, this joining round is also the first round of the first stripe. When you come to the end of this first round, work a jogless join. This prevents an apparent jog where the end of the first color round meets its own beginning. A jogless join in this context means nothing more complicated than simply slipping the first stitch of the new color when you come back around to it. On every round thereafter, simply work normally, right around. In total, you work 10-12 color rounds in this first stripe. The number of actual rounds you choose depends on the yarn: in DK, I work 12, in worsted/aran weight, 10. The general idea is to get a stripe somewhere in the range of 1 1/2 inches high. If you prefer a roomier tam, as for a long hair worn up, by all means add rounds. At the end of the first stripe, bind off using the deco bind off FLB. Once again, offsetting is a good idea, and so is avoiding a jog in the bind off. 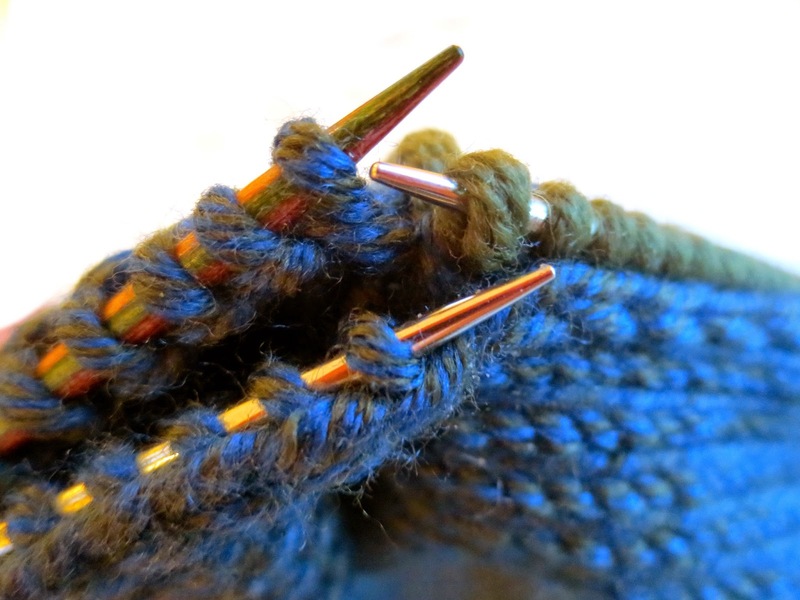 I used the "pretty good" method for the last stitch of the chain bind off to avoid a jog in the bind off. After the bind off, the project can go back into its bag with the FLB yarn, there to rest again until more scrap yarn shows up. Pick up live stitches through the FLB to provide the basis for the second stripe. The written instructions and a diagram are at this link, the photo below shows what this looked like IRL on the blue/green tam. As with the first stripe, slip the first stitch of the stripe color when you come to it to prevent jogging. Work this second stripe the same number of rounds high as the first stripe. Then, just like the first stripe, bind off. Below is a sketch of where the hat is at this point, as well as a photo showing the hat at this point IRL. As with the previous two stripes, the pick up through the bound-off FLB is worked in the same color as the FLB. Before we go further, however, a little theory. 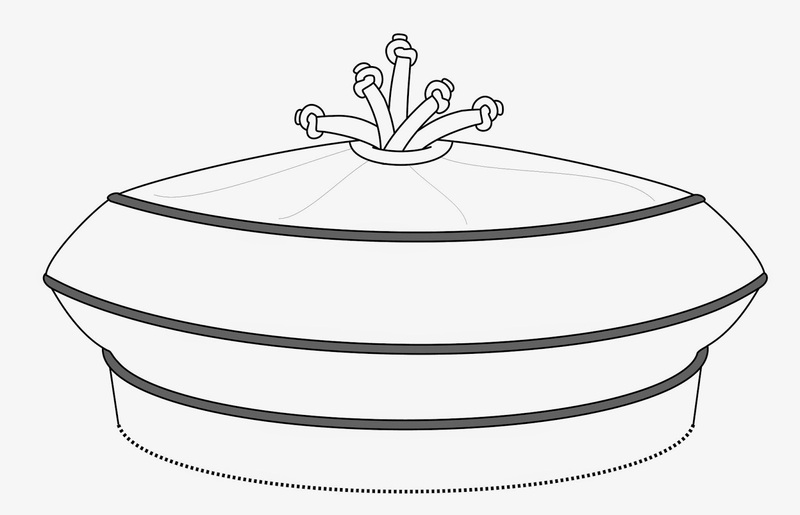 The default decrease for a flat-ish top on a hat is 8 stitches decreased every second round. However, if we were to establish 8 decrease points at the beginning of the tam-top and immediately begin decreasing, we would end up with a tam which looked like it were topped with a stop sign--not a good look. We'll use two tricks to minimize this unfortunate look. First, we'll move the decreases away from the very edge of the stripe, which smooths the decrease points out somewhat. Therefore, we'll work two rounds plain without any decreasing, insert our makers on round 3, then work the first decrease as we knit round 4. Moving the decreases in from the stripe edge smooths out the points, yes, but decreases have a tendency to propagate through the fabric regardless, so more trickery is required. Our second smoothing trick, therefore, is to double the number of decreases to 16 in the first (and only the first!) decrease round, switching to the default 8 decrease rounds thereafter. This works because to the human eye, a 16-sided figure (a hexadecagon) looks a whole lot more like a circle than an 8-sided one does. Order out of chaos: marker insert, or "how to evenly divide an uneven number of stitches"
Theory is one thing, but now comes the reality. Except by the most lucky of accidents, you will not have an even multiple of 16 on your needles. We have been knitting in the laziest possible manner, without measuring or counting a darn thing, so this laziness must now be offset with trickiness as we prepare to insert the red and the white markers. 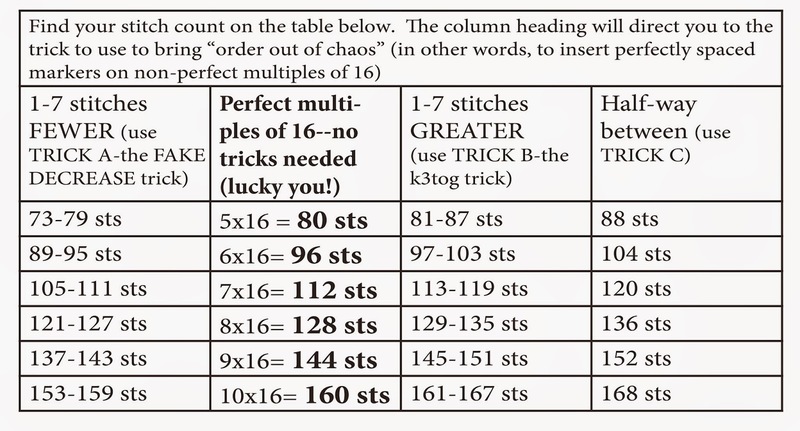 We have several tricks in our arsenal to work with, and which we choose depends on how our stitch count relates to the nearest multiple of 16. There are four possible situations. First, your stitch count could be anything between 1 and 7 stitches LOWER than the nearest multiple of 16. If that is the case, you would use TRICK A just after slipping a red marker. Next, by luck your stitch count might actually be a perfect multiple of 16. If that is the case, you need not use any tricks, simply insert the stitch markers in an alternating red-white pattern, evenly spaced, however many times around your needle. Fourth, your stitch count might be exactly half-way in between two multiples of 16. If this is the case, use TRICK C on the white markers. Although you wouldn't normally need to do this, it is entirely possible to work a k2tog (knit two together) followed IMMEDIATELY by a nearly invisible increase. This looks for all the world as if you had decreased in pattern, although, of course, subtracting a stitch and then immediately adding one back means the stitch count remains the same. This trick works because the decrease shows more than the increase--see for yourself, below is a closeup. In this recipe, the fake decrease trick is only to be used in sections headed by the red markers, because in those locations, a fake decrease will be followed two rounds later by a real decrease, and this actual decrease will propagate through the material. This will eventually create the eye-fooling 16-sided figure despite your fake-decrease trickery two rounds earlier. Suppose you have 110 stitches. This is stitch count appears in the FAKE DECREASE column of the table, so that's the trick to do. You're TWO stitches off the perfect multiple. This means that on two different (and separated) red decrease sections (sections headed by a red marker) you'll work the fake decrease trick. See, if you had 112 stitches, you could insert 14 markers 8 stitches apart (7 sections of 16, each of those sections divided into a red-marker 8-stitch-half and a white-marker 8 stitch-half, for a total of 14 markers). However, since we're two stitches short, and since we're going to work Trick A on the red markers only, then, as we work round 3 inserting markers, we choose two red-marker sections at random (not next to one another, however) and on those sections, we'll insert the following white marker 7 stitches away from the red marker, rather than the normal 8. We mark these special sections where the stitch count is off by KNOTTING the tail of the red marker. At the end of round 3, we have divided our 110 stitches into 12 regular sections--7 white and 5 red--of 8 stitches each, and two special red-knot sections of 7 stitches each, and all the makers will be inserted in an alternating red-white pattern, with the two red-knot sections not adjoining. On the actual decrease round (round 4), every time you come to a marker, you slip the marker, work a k2tog. However, on the two red-knot sections, you'll work a k2tog followed immediately by an m1. At the end of your decrease round (round 4) you'll have 16 sections, each of which is now 7 stitches wide--12 of those sections will have been decreased from their original 8 stitches by means of the k2tog you worked, and the other two sections--the red-knot sections--will be 7 stitches wide because the fake decrease trick left them unchanged at their original 7-stitch width. Tada! Trickiness has provided a work-around, and we get an even spacing despite having started with a random stitch count--order has been brought forth from chaos. It is possible to decrease three stitches into 1 (k3tog) rather than the more usual two stitches into one (k2tog). K3 tog is worked the same exact way as k2tog, just starting one stitch further in. Below is a closeup of the finished result. So, if we count the stitches and find we are a few stitches ABOVE the nearest multiple of 16, we can get rid of these extra stitches via a k3tog instead of a k2tog, spacing the k3togs so they aren't right next to one another, as best as possible. This trick is worked only on the white (intermediate) markers. Suppose you have 149 stitches. This is stitch count appears in the "K3tog" column of the table, so that's the trick to do. You're FIVE stitches off the perfect multiple. This means that on five different (and separated) white decrease sections (sections headed by a white marker) you'll work the k3tog trick. See, if you had 144 stitches, you could insert 18 markers 8 stitches apart (9 sections of 16, each of those sections divided into a red-marker 8-stitch-half and a white-marker 8 stitch-halfhalf, for a total of 18 markers). However, since we're five stitches over, and since we're going to work Trick B on the white markers only, then, as we work round 3 inserting markers, we choose five white marker sections at random (as well-spaced from one another as possible) and on those sections, we'll insert the following red marker 9 stitches away from the white marker, rather than the normal 8. We mark these special sections where the stitch count is off by knotting the tail of the white marker. At the end of round 3, we have divided our 149 stitches into 13 regular sections--4 white and 9 red--of 8 stitches each, and five special white knot sections of 9 stitches each, and all the makers will be inserted in an alternating red-white pattern, with the five white knot sections as well spaced as possible. Note that with 5 special markers, you can't space the special sections evenly around the brim, but try not to get them all on the same side of the tam. On round 4 (the actual decrease round) every time you come to a knotted white marker, you'll slip that marker and work a k3tog, rather than a k2tog. After round 4, you'll have 18 markers, each of which is 7 stitches apart. Again, trickiness has provided a work-around, and we get an order from chaos despite having started with a random stitch count. If you are halfway between multiples of 16 (8 stitches away from the next higher AND the next lower multiple of 16), insert the red and the white markers, but work the first decrease ONLY on the white markers, then begin the red marker decreases on the very next round. This decreases away only 8 stitches at the white makers in the first decrease round, rather than 16, but, because an additional 8 stitches are decreased away at the red markers only 1 round later, the 16-sided figure is still created, fooling the eye into thinking circle, rather than octagon. As far as marker-placement for trick 3, you place the red marker following each white marker one stitch further apart than the white marker following a red marker. This extra stitch in a section headed by a white marker is decreased away in the first (white-marker only) decrease round, leaving the 8 red markers all spaced equally apart. Regardless of which trick you used, as you knit round 5, remove all the white markers--they marked a once-only decrease location. Also on round 5, you must move the red markers over so that the marker is immediately on the LEFT side of the decrease (whether a real decrease, or a fake decrease) worked earlier. Stated otherwise, unless you move the red markers to the left of the decrease, the spiral created by stacked decreases will not develop properly. If you are working with a short circular needle, at some point, your stitch count will decrease so far that dpn's, magic loop or two-circs will have to be used. Kitchener-stitched tailored top, in real life. Quite elegant. no? To make an elegant tailored as on the blue/green tam, the red-marker k2togs continue until there is one stitch between each decrease (16 total stitches). If you want a truly flat hat top, switch to smaller needles when there are 5 stitches in each section. 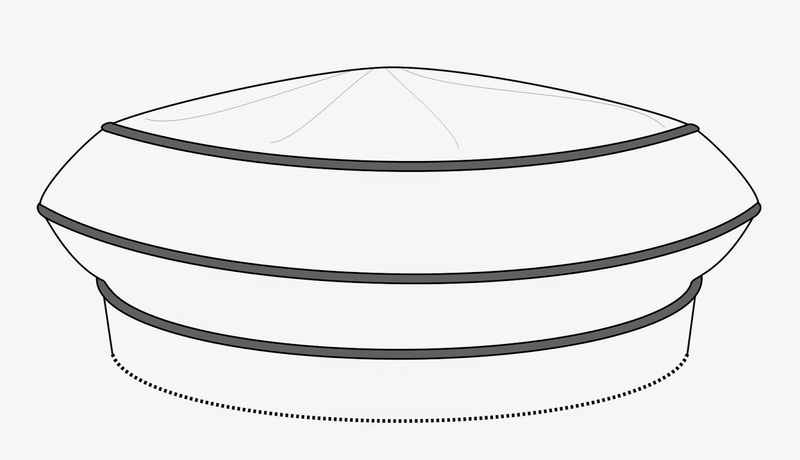 This creates a variant on the "truly flat top" for a ribbed cap. The final 16 stitches are divided onto two dpn's and these two sets of 8 stitches are Kitchener-stitched together, which can be done with a knitting needle. To make an tassel-top as on the beige/multi tam, the red-marker k2togs continue until the tam top is reduced to two stitches between each decrease (so, 3 stitches for each section, 24 stitches total over the eight sections). Next, the tam is chain-bound-off in the FLB color (beige in the beige/multi tam). As with the previous stripes, the following round is picked up through the chain bind off= 24 stitches. Next, a round was worked in the color you've selected for the I-cord tassels, which is rust in the sample tam. the following round is decreased randomly via k2tog's to 15 stitches. Holding all but three stitches on a scrap yarn stitch holder, the three stitches left live are put onto a dpn and worked into a 3 stitch I-cord of random length. * Again 3 stitches are slipped off the holder onto a dpn and worked into an I-cord of random length. The process is repeated from * until all 15 sts are converted into 5 various-length I-cords. The top of each I-cord is knotted to give each I-cord a cute little ending and add a little heft (this entire process is a variant on I-cord tassels). A few running stitches were taken between the cords to connect them at the bottom and tame the tendency of the I cords to spread, and the hat is done. Skim in the ends on the inside. You are now ready to block. The entire blocking process is shown in the below photo. 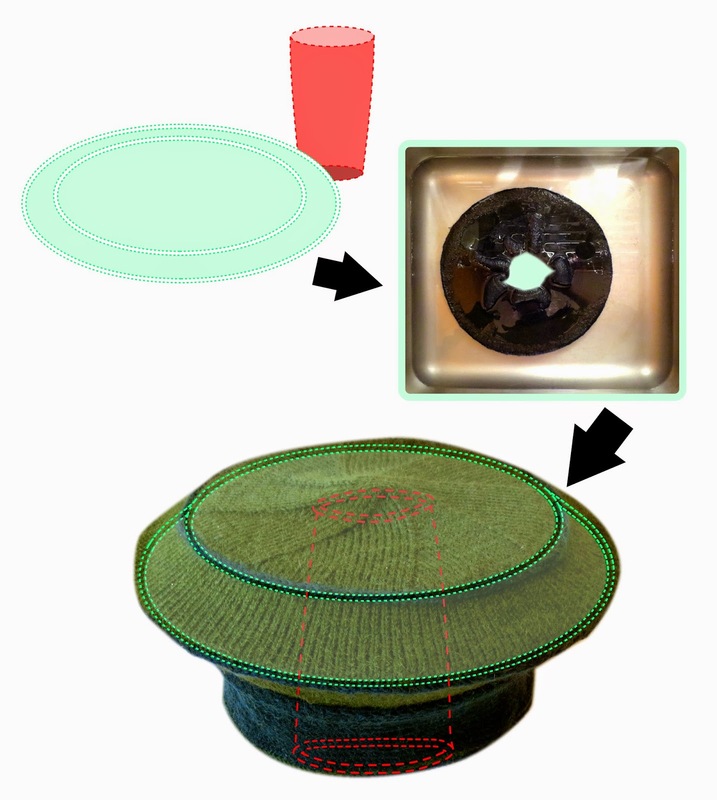 Begin by finding a plate (mint green in illustration) in your desired tam-top size. For a tam, a full-size dinner plate usually does the trick, but if not, thrift stores are a great resource for cheap-o plates in all sizes. Or, cut a blocking form from a flexible cutting board--a pack of these are handy for cutting out blocking forms for many small objects: tam-blockers as well as sock- mitten- and even glove-blockers. The plate can be somewhat larger than the dry tam top, or the same size, but not smaller. Find also, a tall glass, stable enough to support the plate (red in illustration). Fit the plate, convex (bottom) side up, inside the dry tam, then wet the tam-plate sandwich by submerging in a sink partly filled with lukewarm water, as shown. Once the tam is utterly soaking (a few minutes, at least) remove the tam from the water, turn the works upside down, then place the glass under the plate so the tam is suspended with even its bottom band clear of the underlying surface. Pat and smooth the tam over the plate, stretching it to fit evenly, if necessary. 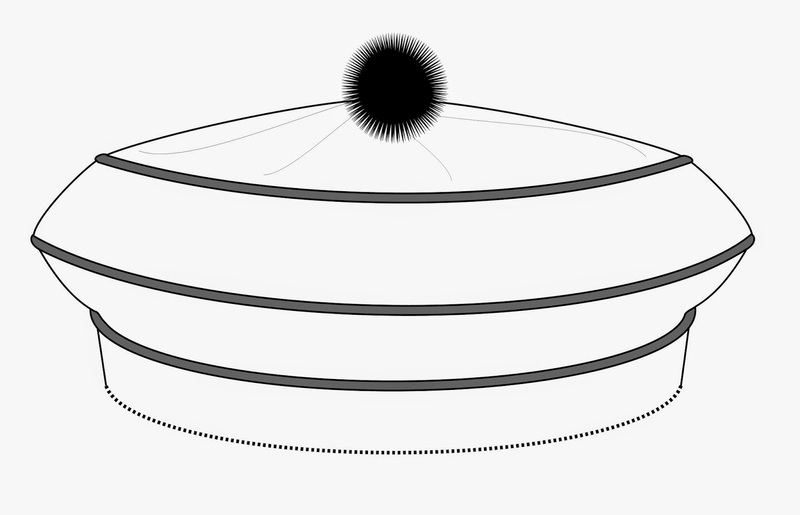 The FLB between stripes 1 and 2 is the largest part of the tam, so that's what runs around the rim of the plate. The tam will now drip dry on its pedestal. Annoyingly, this takes a day at least, since the plate slows the drying time. It is best to leave the tam to dry over a thick and thirsty towel on a waterproof surface--a tile floor or kitchen counter. When utterly dry, remove the plate and the tam will be smoothly blocked. If you choose to add a pom-pom, these are attached after the blocking process is over. Pom-poms on hats are best removed before washing--a washed pom-pom looks awful. Therefore, sew your pom pom down using a different color yarn-it only takes a few big stitches to tack down--and this makes it easy to snip free for washing. Or, you know, use a safety pin. Lazy, yes. 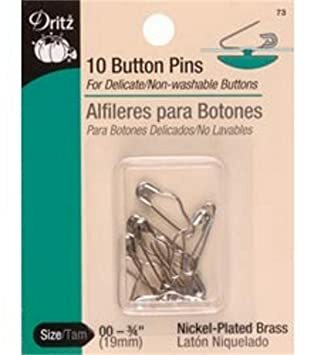 The kind for emergency button repair, with a bump halfway down are best, just be sure the metal of the pin penetrates the solid heart of the pom-pom. 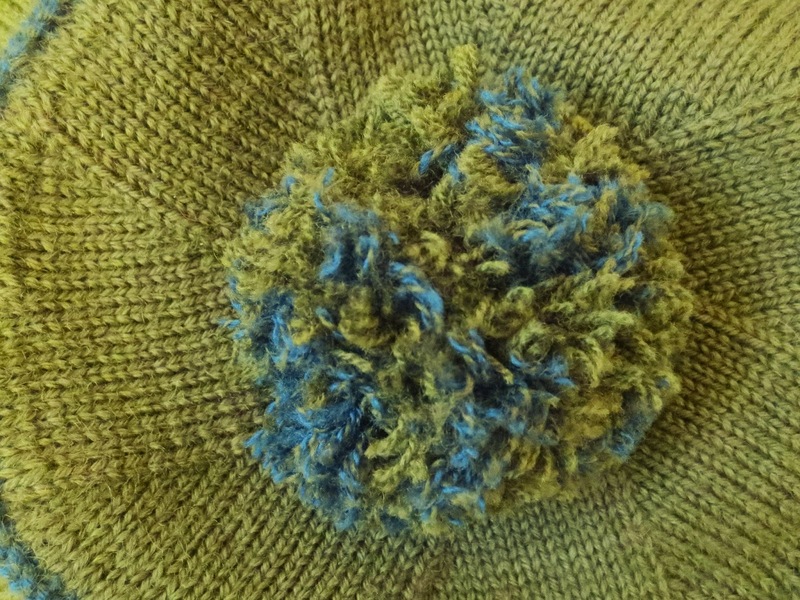 PS: here's the Ravelry Link for this tam. As time goes by, perhaps there will be other examples of this tam for you to look at.